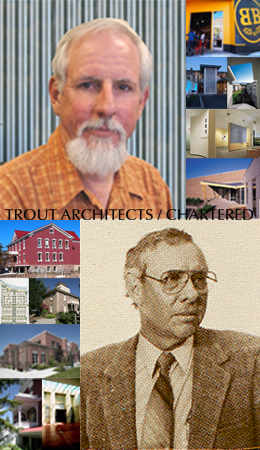 In 1968, C. Ed Trout founded Trout Architects after creating and leading the architectural department at Albertsons grocery stores for seventeen years. In the following years C. Ed Trout & Associates, as it was known then, developed a long list of clients and a multitude of built projects. Steve Trout, Ed Trout’s son, worked in his father’s office as a youngster and after receiving his degree in Architecture at the University of Idaho, acquired ownership of the firm in 1985. As a well respected Boise Architect, Steve Trout continues to lead the firm into a well known architectural design entity with many published and award-wining projects. Our projects are varied. We have worked with government agencies designing, constructing and remodeling administrative buildings, park buildings, meeting and retreat venues, hospital facilities, art museums and libraries. In the private sector of commercial construction, we have helped our clients with master planning large projects, office buildings, multifamily housing, restaurants, lounges, motels, medical clinics and art galleries. We also take time and enjoyment in our custom residential projects, which allows us to develop personal relationships with the homeowners as we develop a space to fit their ever-changing needs. From our experiences in public sector projects and the neighborhood participation required of planning and zoning, we have developed methods and techniques of engaging all the various parties and participants. The net result is public support of these projects and a smooth, timely review process.